You would have to be blind not to notice that the number of women at state and national industry events has been growing for years. I’ve witnessed an increase in the number of women who have risen early to meet over coffee and eggs at PestWorld’s Professional Women in Pest Management (PWIPM) networking breakfast. All women attending PestWorld are welcome. They do not have to belong to PWIPM, a National Pest Management Association (NPMA) committee, to support their sisters in pest management. The PWIPM offers professional development sessions and networking events at the NPMA’s Legislative Day, Academy and PestWorld events; publishes quarterly enewsletters; holds a 5K walk/run at PestWorld to raise money for charity; selects a leader for the Women of Excellence Award; and awards Professional Empowerment Grants to women who want to further their careers. This year, Rachel Alexander of Citron Hygiene in Ontario, Canada, was one of two grant recipients. She is the only female technician on a team of more than 30 men whom she says encourage her to advance within the industry. Alexander says she plans to use her grant money to achieve Associate Certified Entomologist (ACE) certification and help promote pest management to more women in Canada. 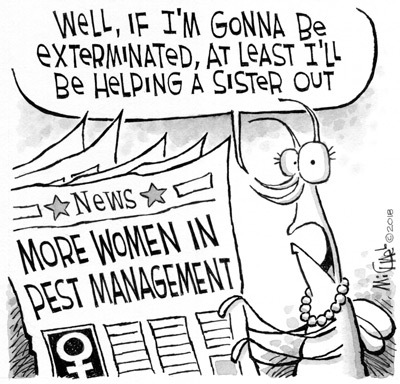 With recruitment and retention a longstanding issue, professional women in pest management represent a growth opportunity for all.